I have been finished from work almost a week now on maternity leave and I have to say I have really been enjoying myself. Obviously my baking time is limited to the amount of energy I have or whether I ache too much to stand for too long but it has been great being able to take things at my own pace, especially with my baking. 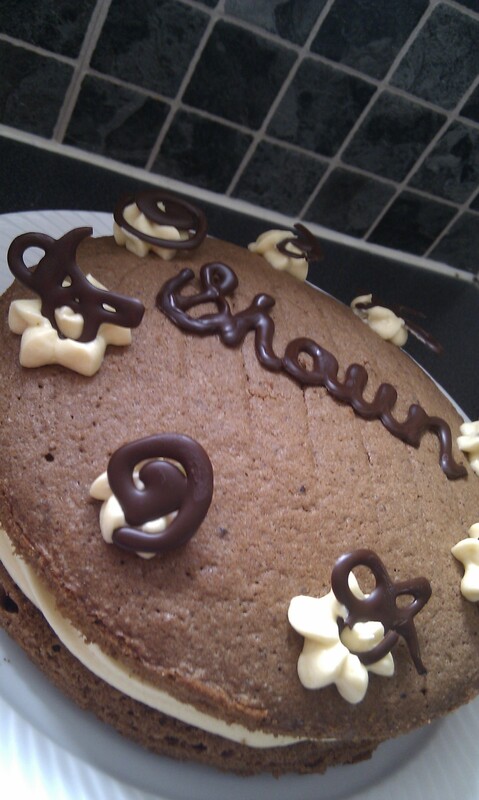 My first task when I finished work was to bake my husband a coffee cake. I always ask people what they would like me to make and a lot of the time I think they think I am joking so never actually say what they would like to eat. Luckily my husband isn’t as shy so when I asked, he said he wanted a coffee cake. I’m not a huge fan of coffee cake myself but I do have a special ingredient in the cupboard that I love, Moka Varnelli. I have written about it before but if you don’t fancy reading that, it is a coffee moka liquor made by Varnelli which comes from Italy, in particular the Marche region where some of my family is from. It is notoriously difficult to get unless you go over there to buy it or want to pay a lot of money to buy a bottle from the internet. Anyway, the taste of the coffee liquor is wonderful so I based the design and taste of the cake around it and it seemed to go down very well with me, my husband, and my parents (much to the disdain of Shaun at having to share his cake). It is such an easy and simple recipe that it is definitely one I will be making again. In a bowl mix the two types of sugars into the margarine until they become a nice light colour. You can’t over beat the mixture at this stage so make sure it is well mixed. Add an egg and two tablespoons of flour and combine till just mixed. Do the same with the other 2 eggs and flour. There will be a little flour left so add this along with the cocoa powder after you have mixed the rest in. Try to only combine the ingredients and don’t over mix. Add the Moka Varnelli and again stir till just combined. Split the mixture into two 8″ cake tins which have been lined with greaseproof paper. Put into the pre-heated oven and bake for 25 minutes. You should easily be able to tell when the cakes are cooked because if you press on the top then it should spring back to shape. If it doesn’t seem fully cooked yet then put back in for 5 minute intervals. Take the cakes out of the tins once they are cool enough to handle and on one side of the cake paint or drizzle over a small amount of Moka Varnelli, then allow the cakes to fully cool. I never give exact measurements for making buttercream icing as I just put it into a bowl and mix together. I would advise using a large bowl and spooning a large wooden spoons worth of margarine (if you have butter then this tastes even richer) and adding in 4-5 tablespoons of icing sugar. Mix the two together carefully. At first it will seem like they will never combine and then all of a sudden they do! Once you have done this add the Moka Varnelli and then mix in a further 2-3 tablespoons of icing sugar. Mix until the icing sugar is all combined and the mixture looks lovely and fluffy – now is a good time to try it for taste. Once the cakes have fully cooled, pipe buttercream into the centre and a few small blobs onto the top of the cake. Join the two halves together but don’t press down too hard! Melt some dark chocolate and pipe any interesting shapes or words onto greaseproof paper. Cool the chocolate shapes in the fridge and then once hard peel off and use to decorate. Previous post5 Minute chocolate mug cake – The most dangerous cake recipe in the world?